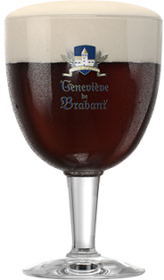 Geneviève de Brabant Double is a Belgian beer, it has an alcohol content of 6.5%. As brown as the morning breeze but as fierce as the noonday sun, this beer warms the heart and delights the palate. With all the colour and richness of dark gold, Double de Brabant is divine nectar for the taste-buds and enchanting for the spirit. With its fine brown colour and its creamy foam, it entices you to go a-wandering down the country paths of a province renowned for its brewing. With a mischievous nose, this characterful, racy and wily brown ale quickly awakens your senses to gently full-bodied flavours that are almost akin to a scent but are true to the beer’s original roasted malt. It is swathed in a bouquet of hops and refreshed with orange zest, while releasing a subtle hint of chicory. All this generates a taste for more, especially once the glass is empty. A brown beauty with hazel eyes, pleasing to palate and throat alike.